The significance of Pastor Mark Driscoll’s t-shirt ministry is that it reveals much about his attitude to the holy things of God. 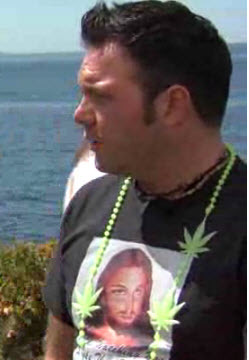 In a sermon on the Emerging Church in the Religion Saves series, preached in February 2008, Pastor Driscoll wears a Deejay Jazzy Jesus t-shirt. He commented: ‘I dress in regular clothes – at least what I consider to be regular clothes, right? I don’t come in a suit, because I don’t like them, and I think the Jesus t-shirts are funny, and this one is from Urban Outfitters. It’s Deejay Jazzy Jesus and we’re – and if you think about it, here’s what’s weird. At Urban Outfitters, they’re selling Jesus t-shirts, but if you ask the kid selling the Jesus t-shirts, “Is there a t-shirt of his mother, Mary?” They believe in the virgin birth. I mean, bizarre – Urban Outfitters does and emerging pastors are like, “I don’t know.” We’ll go to Urban Outfitters and ask the non-Christian in the Virgin Mary t-shirt. He’ll tell you it happened, even though he’s going to hell wearing the Virgin Mary shirt, at least he’s got that settled. I mean, it’s just weird.’ Here Driscoll says that he wears Jesus t-shirts because he thinks they are funny. He is amused by the Christian t-shirts and they have helped him build his image as a cool, entertaining Pastor. In this article we see some of the t-shirts that Driscoll thinks are funny. In the sixth sermon in the series, ‘What will Jesus do Upon his Return?’ –Pastor Driscoll comments: ‘And you should have obtained when you came in something called the loop. Those are the notes for our course of study to help guide our time together, and this week’s t-shirt, part of the ‘shtick’ [it means, a comic theme or gimmick] if you get a new t-shirt, every week. This is actually my Jesus bowling shirt. I’ll show you the back because that is the good part. 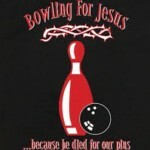 It says, “Bowling for Jesus, he died for our pins, with a P.” (Laughter) So, that’s this week’s shirt. Next week will be another one. Good to have you all with us. I’ll go ahead and pray. 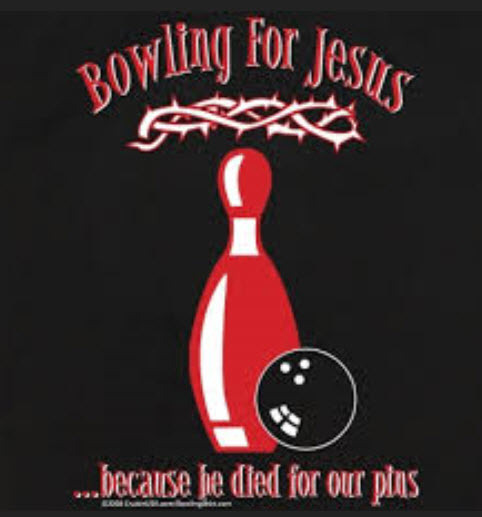 And we will look at this issue of what happens when Jesus comes back.’ The punch line of Driscoll t-shirt, ‘Jesus died for our pins’ is deeply offensive to God, for it profanes the Cross of Christ. According to the Scriptures, ‘Christ died for our sins, the just for the unjust, to bring us to God’ (1 Peter 3.15). For Driscoll to say Christ died for our pins, and raise a laugh in the Mars Hill congregation, is to profane the Cross of Christ by making it an object of fun. 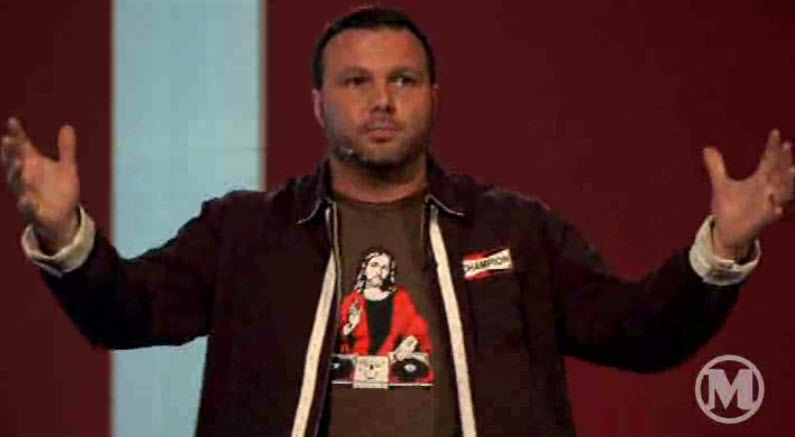 Introducing his sermon, ‘Where is Jesus Today?’ Mark Driscoll says: ‘This week, I’m wearing my Buddy Christ t-shirt, Who’s your buddy, it says. From the film Dogma, if you didn’t see that, Alanis Morrisett plays God. So, that’s a horrible, horrible, horrible thing. She’s Canadian, I mean, come on. (Laughter) God is obviously not Canadian.’ Released in 1999, Dogma is an outrageously blasphemous film that ridicules the Christian faith and presents an image of Buddy Christ. 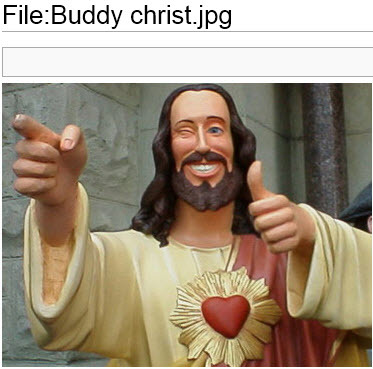 The image of Buddy Christ has become an object of ridicule among the ungodly. It is a blasphemous attack on the Christ of God, revealed in Scripture. 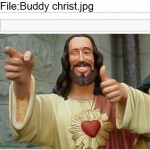 Pastor Driscoll, by wearing a Buddy Christ t-shirt in the pulpit, has condoned blasphemy in his church, and in the worldwide audience that views his sermons on the internet. In Vintage Jesus Part 4, ‘Did Jesus Rise from Death?’­– Driscoll explains his t-shirt: ‘I’ll go ahead and pray and just so you know this week’s t-shirt is Jesus is my guild leader for those of you who are online video game fanatics and World of Warcraft addicts. 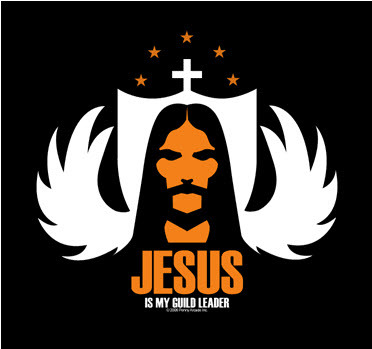 So, Jesus is our guild leader. So I’ll go ahead and pray and we’ll get right to work it’s a good one tonight. And glad to have you all out.’ To understand the significance of this t-shirt we need to know is that the term ‘Guild Leader’ linked to the computer gaming world. A guild is an organised group of gamers who regularly play together in multiplayer games. ‘Guild leaders’ are the masters of their respective guilds. So the implied message of this t-shirt is that Jesus is involved with online computer games, like the violent World of Warcraft. God, save me from your followers! In his sermon on humor in the Religion Saves Series, Driscoll wears another t-shirt. He says: ‘But I’ll share with you tonight’s lovely T-shirt. It was sent to me by a podcaster. It says, God, save me from your followers. (Laughter) So, this is a good one. I like this one a lot. People send me shirts. I get ‘em from all over the world. If you send one, make it a large, not in a pastel color, and I don’t wear used clothing, that’s gross. (Laughter) So – “it’s vintage.” No, it’s used. Somebody else sweated in it. That’s weird. I won’t do that. So, I’ll go ahead and pray, and we’ll get to work on tonight’s question. Good to have you all with us. And I’m looking forward to it. Father God, I thank you that I get to teach the Bible at Mars Hill Church. I thank you because I have as much or more freedom and as much or more fun than any other preacher in the world.’ Driscoll’ series of sermons in Proverbs, preached in 2009, provides further examples of Driscoll’s t-shirts in the pulpit. These t-shirts seem to focus on skulls. In a series of sermons entitled Trial, preached in 2009 and based on the two epistles of Peter, Pastor Driscoll again wore t-shirts. 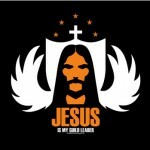 In his sermon on the Third Commandment, preached in September 2013, Pastor Mark Driscoll showed the congregation a picture of himself wearing his Jesus is my Homeboy t-shirt and expressed some regret. He said: ‘So, I wore some Jesus t-shirts, and I probably wouldn’t do that today. I don’t think it was a good idea. So, I wouldn’t wear that shirt today because it doesn’t fit, and I think it violates the third commandment.’ He went on: ‘So, some of you say, “Does that make you a hypocrite?” OK, a repentant hypocrite who’s trying to learn, by the grace of God.’ So Pastor Driscoll has admitted that wearing his t-shirt Jesus is my Homeboy, profaned the named of Christ and violated the Third Commandment. 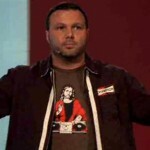 In this article we have seen Pastor Mark Driscoll say that he thinks his DeeJay Jazzy Jesus t-shirt is funny. We have seen him trivialise the Cross of Christ, promoted the blasphemous image of Buddy Christ, and suggest that Jesus is a computer gaming guild leader. Clearly, these t-shirts violate the Third Commandment, and Driscoll is well aware of that, yet they all remain on his website, and are widely available to be viewed on the internet. We must conclude that Pastor Driscoll’s t-shirt ministry has profaned the holy things of God. All the images mentioned in this article, and presented in our video ‘Driscoll’s t-shirt ministry: A study in profanity’, are currently available on the Mars Hill Church website. If Driscoll’s repentance was genuine then he would have removed these profane images from his website. But he has not done so, and the profanity continues.